The things I picked up today where not vintage or even particularly desirable in my world, but they were free and that goes a long way with me. I spotted these on Craigslist several days ago, and had been in communication with the owner a few times to arrange the pick-up today. Both had "issues" and both she and I were hopeful they could be fixed. 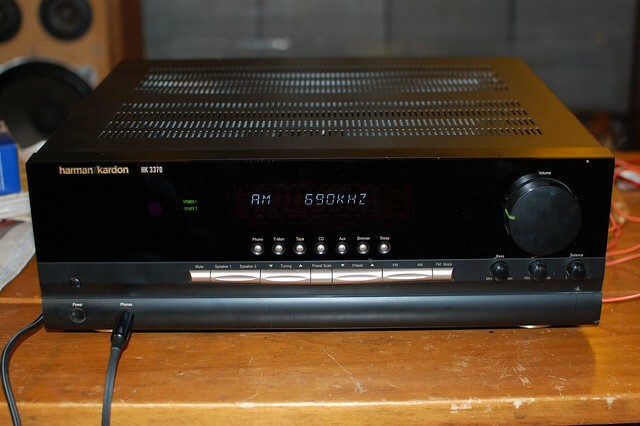 First there was a receiver, the Harman Kardon HK3370 with only one channel working. I also received a small pair of 2 way Paradigm speakers. Her description of that sounded like damaged or rotten foam surround on the woofer. Harman Kardon have made some very good equipment over the years and I have had some gear from them before. I think the only piece I owned was a cassette tape deck but it was a very good one that I had for 10 or 15 years. When I got out of cassettes a few years ago it went by by though. I still like the look of some of their stuff including the current models and often more than other brands. I also think it is generally well made. The HK3370 is a 70 watt per side stereo receiver. It's not retro in age or looks by any stretch being made up of black metal with a plastic face and with digital tuning and display, plus a remote control. It is just stereo though and is largely discrete components, or at least in the output section anyway, and does come with a quite a large power transformer and is a fairly heavy unit at about 25lbs. I am not sure the model release year but it was roughly 2000. Anyway after finding out what model it was on Craigslist, I had no idea what I would find inside, but did have a look at images (especially on Amazon) and had some hope for an easy resolution to the "only one side working" thing. Many things that go wrong are easy fixes, but still not worth paying for professional services at $60 or 80 per hour or more. Many times a 50 cent fuse has blown or a wire is loose or something else relatively easy is all it needs. In the case of this unit there are jumpers on the back which connect the pre-amp and power amp sections so that was my first thought as the culprit. Sometimes those jumpers are simply missing and the result is that the stereo does not appear to work. When I got it I saw the jumpers where in place, so I opened it up at home and then checked all the fuses. My meter showed continuity on all 6 or 7 of them (meaning they worked), so I played around with the pre out and main in jacks for a while. Using another receiver and the tape out loops I was able to isolate the problem to the pre-amp section, but that is actually the more complex area as all the controls are in that area. I was getting close to giving up for today when I decided to check all the jacks and plugs throughout the circuit. Most older gear tended to have fewer connectors that could be unplugged and more direct solder joints. Newer stuff has more circuit boards that are modular and plugged in as needed. After a bunch of prodding and flexing I found the problem! 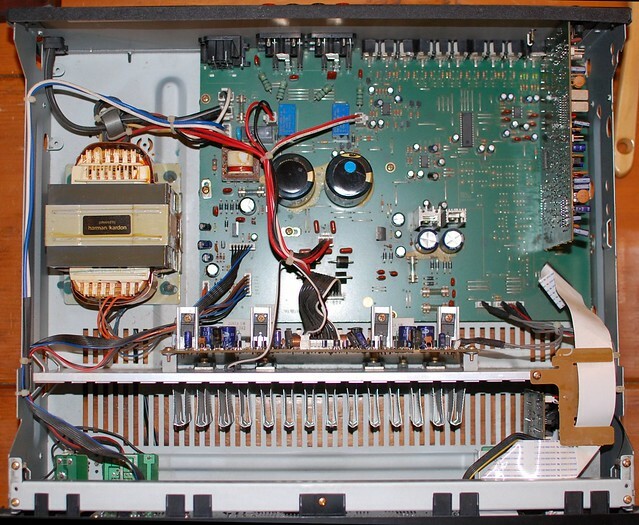 It was a loose socket at the connection to the volume control under the white ribbon cable at the lower right hand corner in the picture. Once I had figured that out I soon had the case put back together and it's now ready for either a re-sell, storage until I find a use for it, or maybe it will go in Linda's living room. I've certainly got enough for a complete system for her over there.